A research team, lead by chemistry professor Colin Raston, from Flinders University in Adelaide have built a machine which can unravel proteins. 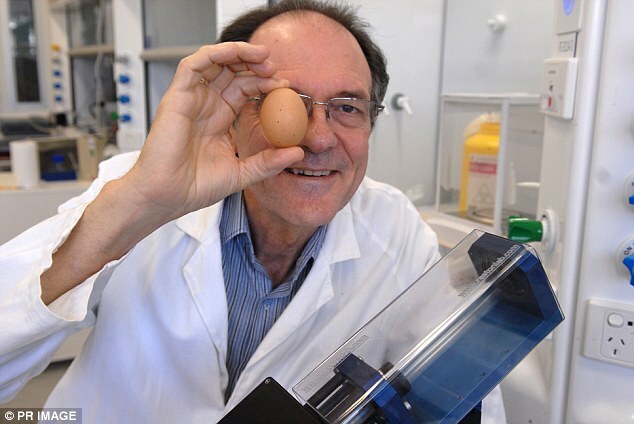 In short, he fed a boiled hen egg into the vortex fluidic device, and it came back uncooked. “It’s not what we set out to do, to unboil an egg, but it’s the way of explaining the science involved and helping the wider world realize the momentousness of it. The sheer scale of this is mind boggling. The global pharmaceutical industry alone is worth $160 billion annually and the processing of proteins is central to it. The VFD is completely changing it – and is set to do the same for the fuel and food industries. It’s impossible to place a price on the value of this device,” said Raston. Continue reading for another video and more information. “Professor Raston sported a tie emblazoned with fried eggs for the occasion. Scientists from Flinders University and the University of California-Irvine worked together on the machine which could drastically cut costs for the pharmaceutical industry.Researchers discovered the ability to untangle the proteins in the white of a hard-boiled egg to make them active again in a clear solution. Proteins are used in a variety of industries including in the development of cancer medications,” according to Mail Online.